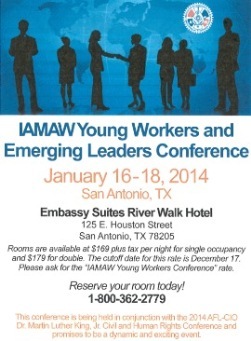 Register now for the IAM’s Young Workers and Emerging Leaders Conference to be held in San Antonio, TX, January 16-18, 2014. The conference will be in conjunction with the AFL-CIO’s 2014 Martin Luther King, Jr. Observance which is also taking place in San Antonio. The IAM Young Workers and Emerging Leaders Conference will be held at the Embassy Suites Riverwalk Hotel. The IAM has secured a special room rate of $169 plus tax for single occupancy and $179 plus tax per night for double occupancy. The cutoff date for the special rate is December 17, 2013. Call the hotel directly at 1-800-362-2779 to make your reservation. Conference registration will be from 2 pm to 4 pm on Thursday January 16, 2014. Attendees will participate in the AFL-CIO Community Services day activities on Friday, January 17. There will be a general session and workshops on Saturday, January 18 from 8 am to 3 pm. Contact the IAM Human Rights Department at (301) 967-4747 for more information. Click here for the official call and registration form. Click on the appropriate link for a flyer about the event: IAM Lodges, TCU/IAM Lodges and NFFE/IAM Lodges.